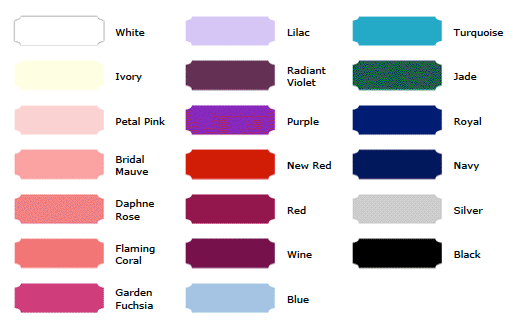 We offer a wide array of colors in the following fabrics. If you do not see your desired color, ask us to dye the fabric for you. 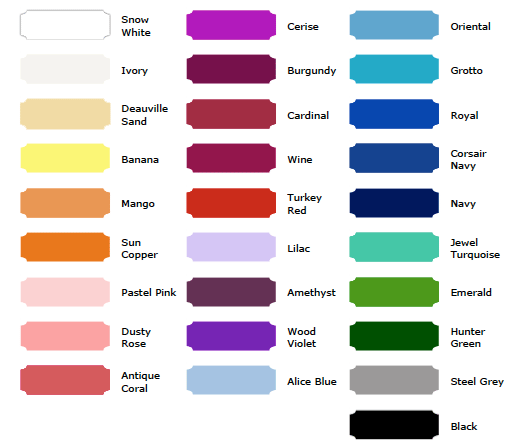 We are happy to help you with your color and fabric decision-making process. Note: Please be aware that colors may vary due to differences in varying monitors. In addition to the following selection, we offer the service of utilizing your fabric. This will aide in your ability to see the fabric first hand before construction begins. We suggest purchasing 1.5 yards of fabric for a bodice and basque at 45" - 60" wide, per tutu. If we construct a "Russian Styled" bodice (bodice with basque all in one), then we suggest 1.25 yards at 45" - 60" wide per tutu. You will need up to 2.5 yards of fabric for a men's tunic. Please send the original receipt with your fabric and we will deduct the cost of your fabric (up to $35.00 ea.) from the price of your tutu or tunic. Please note that we are using your fabric in the "Notes" section of the "Order Form Worksheet" when placing your order so that we honor the fabric price deduction on your invoice. An element that will further enhance the design of your Tutu Etoile costume is the use of different colored layers of net or tulle in your tutus or contrasting fabrics such as bengaline with brocade in different areas of your bodice or tunic. Please see the styles offered to know where you can make fabric or color changes to your Bodices and Tunics. 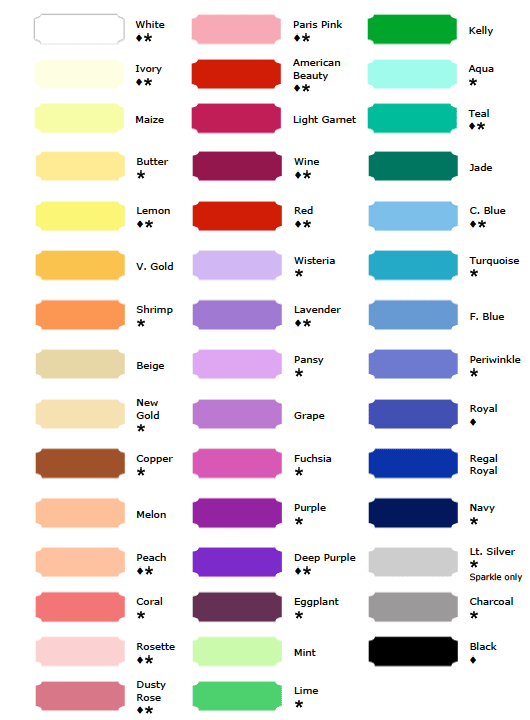 Click on any of the fabric names below to see more information and available colors (remember, we can dye the fabric if you don't see the color you need. Bengaline (medium – heavy weight faille), fabric content 49% Acetate 51% cotton. Bengaline is a wonderfully stable fabric with a slight sheen that reads very rich on stage. This fabric is suggested for all bodice and tunic styles. Stretch Velvet; fabric content, 90% Polyester 10% Spandex. This fabric is perfect for a sleek fit, contemporary look, growing body and ideal for smaller companies that don’t have time or labor budgeted to continually alter costumes. This fabric is suggested for all bodice and tunic styles and we particularly recommend it for our “Russian Styled” bodices. Metallic Satin Brocade: Brocade is a beautiful addition to our selection that will compliment your costume. 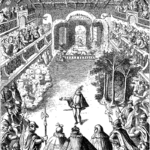 This fabric is suggested for all bodice and tunic styles. Metallic Satin Brocade: fabric content: 85% Acetate, 15% Metal. Satin Brocade: fabric content: 75% Acetate, 25% Polyester. Double Georgette: fabric content: 100% Polyester. This fabric is a medium weight, soft drape, semi-sheer fabric that is intended for all sleeves, ruffled cuff and insets. Tulle: fabric content: 100% Nylon. Tulle is traditionally used in constructing Romantic tutus. We also offer a tulle Bell tutu for a softer draped skirt.